BIG SALE!! SQUARE CRYSTAL LED LIGHT STANDS BIG SALE!! For Eggs, Spheres & Globes! This 3" square, portable 3 color LED light stand will display your laser crystal cubes, spun glass and paperweights with style! It has a Silver Base with a flat clear top where 3 LED lights in red, blue and yellow slowly twinkle on and off to create a light show. There is an on-off switch on the side. Use 3 AA batteries for days of continuous use. Batteries are not included, click for AA batteries. This 3" square, portable 3 color LED light stand offers a decorative LED pedestal for your small sculptures, art pieces or paperweights! It has a satin Black base with a flat clear top where 3 LED lights red, blue and yellow randomly transition on and off to create a pleasing light show. There is an on-off switch on the side. Use 3 AA batteries for days of continuous use. Batteries are not included, click for AA batteries. This 2 1/2" square, portable 4 color LED light stand has a satin Silver Base and a flat top with 4 extra bright LED lights in blue, green and 2 red with an unusual 4 sided light window that extends the light show into the room. The color changing sequence is slightly faster and alternates from red, green, blue, purple to other mixed colors. This light base can be used as a portable party light or just to highlight your favorite crystal or bottle. There is an on-off switch on the side. Use 3 AAA batteries for days of continuous use. Batteries are not included, click for AAA batteries. 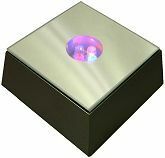 This 2 1/2" square, portable 4 color LED light stand offers a simple yet classic LED pedestal for your small sculptures, art pieces or paperweights! 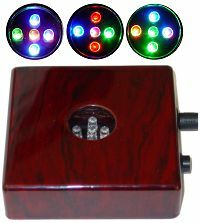 It has a satin Silver Base and a flat mirror top with 4 extra bright LED lights in red, blue, green and yellow that change randomly with a transition of four twinkling lights alternating to three, two and one color light and so on. There is an on-off switch on the side. Use 3 AAA batteries for days of continuous use. Batteries are not included, click for AAA batteries. You asked for this base in a sleek Black finish and here it is! 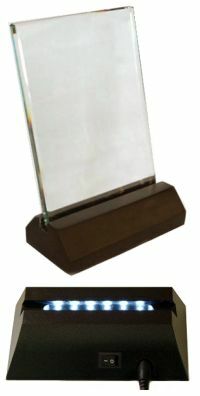 Classic 2 1/2" square, 4 color LED light base for your awards, 3D laser crystal or memorial glass. It has a shiny Black Base and a flat mirror top with 4 extra bright LED lights in red, blue, green and yellow that gently twinkle on and off randomly for a rainbow light show. There is an on-off switch on the side. Use 3 AAA batteries for days of continuous use. Batteries are not included, click for AAA batteries. This sturdy, high quality 3" square, portable 4 color LED light stand has a satin Silver Base and a tapered flat top with a 1" wide opening with 4 extra bright LED lights in red, blue, green and yellow. The 4 LED lights slowly twinkle on and off creating a color changing light show. There is an on-off switch on the side. Use 3 AA batteries for days of continuous use. Batteries are not included, click for AA batteries. 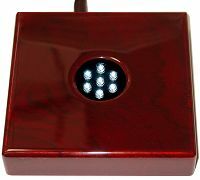 This 2 1/2" square, portable 3 color LED light stand has a satin Black Base and a flat mirror top with 3 extra bright LED lights in red, blue and yellow with an unusual 4 sided light window that extends the light show into the room. The three color lights alternate on and off slowly for a rainbow light show. This light base can easily be used as an inexpensive, portable party light. There is an on-off switch on the side. Use 3 AAA batteries for days of continuous use. Batteries are not included, click for AAA batteries. Elegant and simple rectangular 15 LED light display stand in silver finish with mirror top and clear centered strip where 15 LED lights, 4 red, 4 blue, 4 yellow and 3 green produce a full spectrum twinkling light show as the 4 primary colors slowly cycle on and off randomly. Boxed with a 6 volt AC adapter included or use 4 AA batteries for days of continuous use. Batteries are not included, click for AA batteries. New high tech 2 3/4" square light stand has 9 LED lights that individually change colors slowly to produce a TRUE RAINBOW light show! Each LED light cycles randomly through multiple colors including blue, red, yellow, green, pink, purple and orange and more. This art gallery quality light base has an elegant satin black finish, cushion pads for scratch protection and is gift boxed with a 4.5 volt AC adapter included, there is no on/off switch. 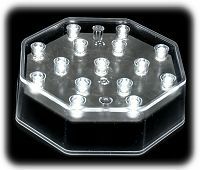 Use this next generation light base for your 3D Crystal, trophies and paperweights. 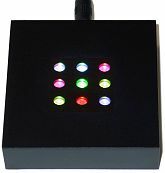 Elegant gallery quality 3 5/8" square light base has 12 extra bright LED lights that actually CHANGE color and randomly cycle through infinite colors including blue, red, yellow, green, pink, purple and orange and more for a truly rainbow style light show. The large centered lighted area is 1 3/8"L by 1" W. The sturdy satin black finish base has 4 cushion pads for scratch protection and is boxed with a 4.5 volt AC adapter included, there is no on/off switch. New state-of-the-art light base has 10 color LED lights that individually change colors slowly to create a TRUE RAINBOW light show! Each LED light cycles slowly through multiple colors including blue, red, yellow, green, pink, purple and orange and more. 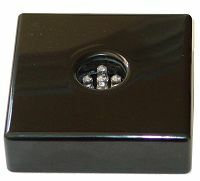 This 4 1/4" long by 2 3/8" wide rectangular art gallery style light base has a sleek satin black finish, cushion pads for scratch protection and is gift boxed with a 4.5 volt AC adapter included, there is no on/off switch. Large 4 7/8" long by 3 1/4" wide electric light base has 12 extra bright COLOR LED lights that will highlight your treasured piece with carefree elegance!. 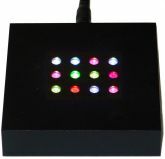 The 12 LED lights individually change color slowly and produce a continuous rainbow light show. 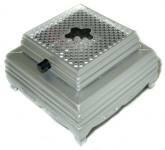 This base has 4 cushion pads for scratch protection and is boxed with a 4.5 volt AC adapter included, there is no on/off switch. 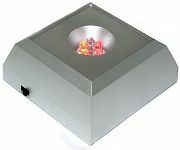 Show off your glass sculptures, art pieces or paperweights to their best advantage with this next generation light base. This extra large 7 3/4" L by 3 7/8" W sleek black light base has 18 extra bright COLOR LED lights in the 2 1/4" L lighted center area. The lights independently slowly change from blue, red, yellow, green, pink, purple to orange and more for a mesmerizing rainbow light show. This base has 4 cushion pads for scratch protection and is gift boxed with a 4.5 volt AC adapter included, there is no on/off switch. 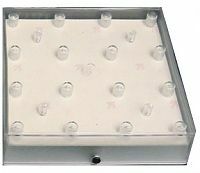 Light up your 3D glass photos, awards, crystal and agate slabs with this slotted white 6 LED light stand. The 4" long open ended slot top is slightly slanted and 1/2" wide with 6 extra large white LED lights that produce super bright, continuous light with NO twinkling. The base is 4 1/2" L by 2 3/4" W with an On/Off switch on the back and 4.5 volt AC adapter included. Glass sample not included. Attractive 5" square, white LED light stand is a perfect table centerpiece for vases, crystal or any large item you wish to highlight. It has a clear flat 5" W top with 16 extra bright white LED lights that remain fully lit and do not twinkle. The clear frosted base is also lit up, allowing the light to be visible on four sides. There is an on-off switch on the side and it is fully portable, Use 3 AA batteries for days of continuous use. Batteries are not included, click for AA batteries. Attractive 4" hexagon white LED light stand is a perfect table centerpiece for vases, crystal or any large item you wish to highlight. It has a clear flat 4" W top with 15 extra bright white LED lights that remain fully lit and do not twinkle. The clear frosted base is also lit up, allowing a ring of light on the sides. There is an on-off switch on the side and it is fully portable, Use 3 AA batteries for 10 to 12 hours of continuous use. Batteries are not included. Elegant and simple rectangular 15 LED light display stand in silver finish with mirror top and clear centered strip where 15 WHITE extra bright LED lights produce CONSTANT WHITE light. Boxed with a USB cord and 6 volt AC Travel adapter included or use 4 AA batteries for days of continuous use. There is an on-off switch on the side. Batteries are not included, click for AA batteries. Elegant and simple rectangular 30 LED light display stand in silver finish with mirror top and clear centered strip has DUAL settings of WHITE only or COLOR only lights with an On/Off switch. The 1st setting has 15 WHITE extra bright LED lights that produce CONSTANT WHITE light. 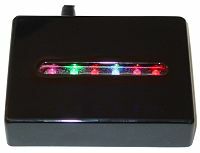 The 2nd setting has 15 COLOR LED lights, 4 red, 4 blue, 4 yellow and 3 green and produces a twinkling light show by blending the LED color lights. You can now have the best of both worlds to illuminate your sculptures, art and crystal pieces! Boxed with a 6 volt AC adapter included or use 4 AA batteries for days of continuous use. Batteries are not included, click for AA batteries. Heirloom quality wood light base has 5 extra bright white lights that stay on and do not twinkle. This craftsman quality, black lacquer wood light stand has an on/off switch, a plush velour base for scratch protection and is gift boxed with a 4.5 volt AC adapter included. 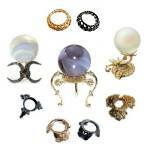 Holds 2" to 6" wide spheres, eggs and heavy crystal or glass. Here is our custom made, hand crafted large 5" square light base with 7 extra bright white lights in a size suitable for larger and heavier crystal balls and art glass. This superb quality, cherry finish wood light stand has an on/off switch, a plush velour base for scratch protection and is gift boxed with a 4.5 volt AC adapter included. Holds 3" to 8" wide spheres, eggs and heavy crystal or glass. Art gallery style wood light base has 6 extra bright color LED lights that individually transition slowly through multiple colors including blue, red, yellow, green, pink, purple, orange and more for a mesmerizing light show. This hand crafted black lacquer wood light stand has an on/off switch, a scratch free velour base and is gift boxed with a 4.5 volt AC adapter included. Heirloom quality wood light base has 6 extra bright white LED lights that stay on and do not twinkle. This craftsman quality, black lacquer wood light stand has an on/off switch, a plush velour base for scratch protection and is gift boxed with a 4.5 volt AC adapter included. Easily highlight your memorial glass, art pieces or crystals without the inconvenience of a bulky light stand or the hassle of batteries! New state-of-the-art, heirloom quality wood light base has 8 color LED lights that individually change colors slowly to create a TRUE RAINBOW light show! Each LED light transitions slowly through multiple colors including blue, red, yellow, green, pink, purple, orange and more. This upscale, black lacquer wood light stand has an on/off switch, a plush velour base for scratch protection and is gift boxed with a 4.5 volt AC adapter included. Show off your 3D photos, memorial glass or art pieces in style with this next generation light base. New state-of-the-art, heirloom quality wood light base has 11 color LED lights that individually change colors slowly to create a TRUE RAINBOW light show! Each LED light transitions slowly through multiple colors including blue, red, yellow, green, pink, purple, orange and more. This craftsman quality, black lacquer wood light base has an on/off switch, a plush velour base for scratch protection and is gift boxed with a 4.5 volt AC adapter included. Show off your 3D photos, memorial glass or art pieces in style with this next generation light base. 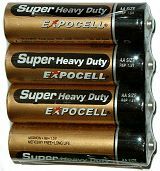 Expocell Brand AAA 4-pack super heavy duty batteries are mercury free. Now you can conveniently purchase your batteries as well as your favorite battery operated LED Crystal Light Bases at the same time! Expocell Brand AA 4-pack super heavy duty batteries are mercury free. Now you can conveniently purchase your batteries as well as your favorite battery operated LED Crystal Light Bases at the same time! High tech heirloom quality wood light base has 5 color LED lights that individually change colors slowly to create a TRUE RAINBOW light show! Each LED light transitions slowly through multiple colors including blue, red, yellow, green, pink, purple, orange and more. This craftsman quality, cherry lacquer wood light stand has an on/off switch, a plush velour base for scratch protection and is gift boxed with a 4.5 volt AC adapter included. Holds 2" to 6" wide spheres, eggs and heavy Art Glass.